I’m mad about plaid! 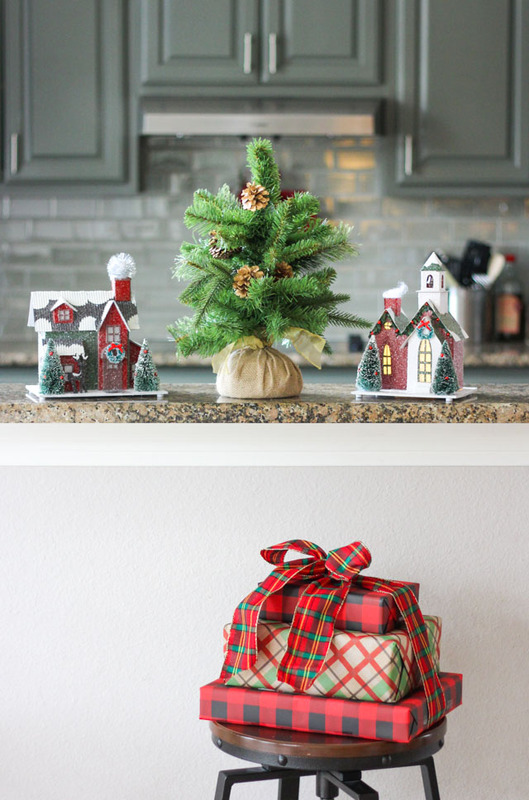 It is especially perfect for the holidays, and it is so fun to mix different plaid prints together for a modern and hip vibe. 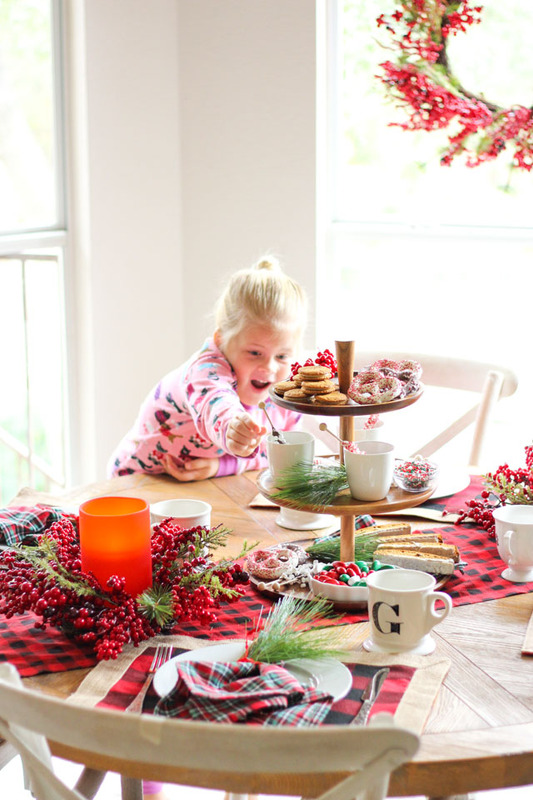 Today I’m partnering with Tuesday Morning to show how you can create a plaid-filled Christmas table for your family that looks oh so special, but is so easy to pull together with a few awesome and inexpensive finds from Tuesday Morning. 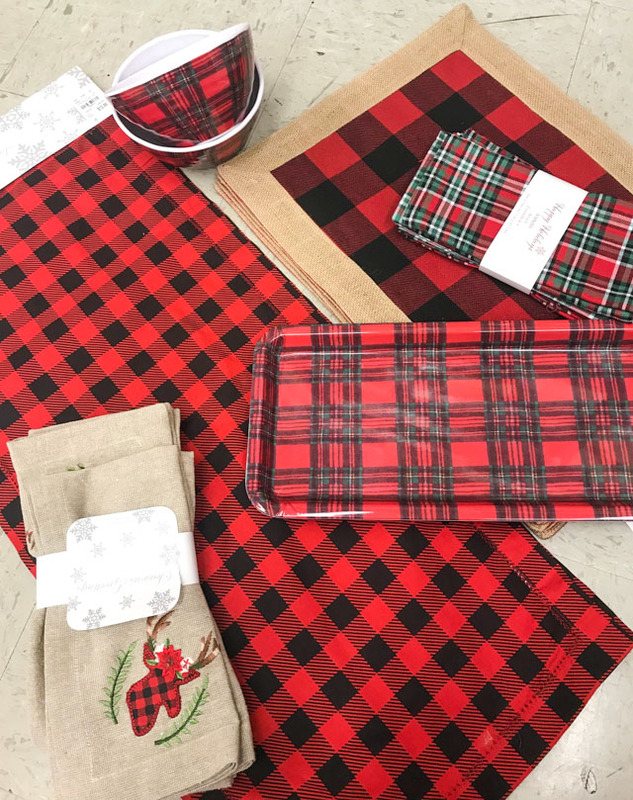 These plaid napkins and buffalo check placemats were only $2.50 each! 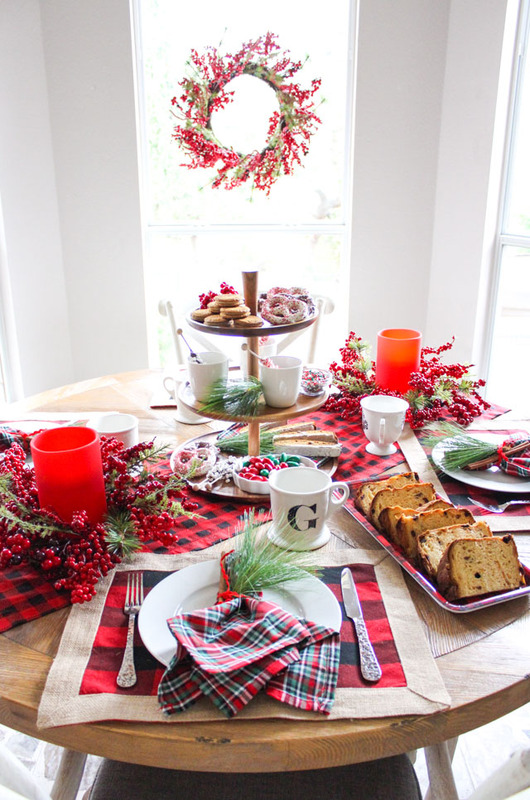 Read on for my 6 tips for creating a fabulously plaid Christmas breakfast table, and head to your local Tuesday Morning store and scoop up all the plaid before it is gone! My mother-in-law introduced me to the joys of Tuesday Morning years ago. If you love the thrill of the hunt when it comes to finding a unique piece of decor or a great deal, this is the store for you! They focus on name-brand closeout items and their assortment is frequently changing. If you see something you like you’ll want to scoop it up because it won’t be around for long. 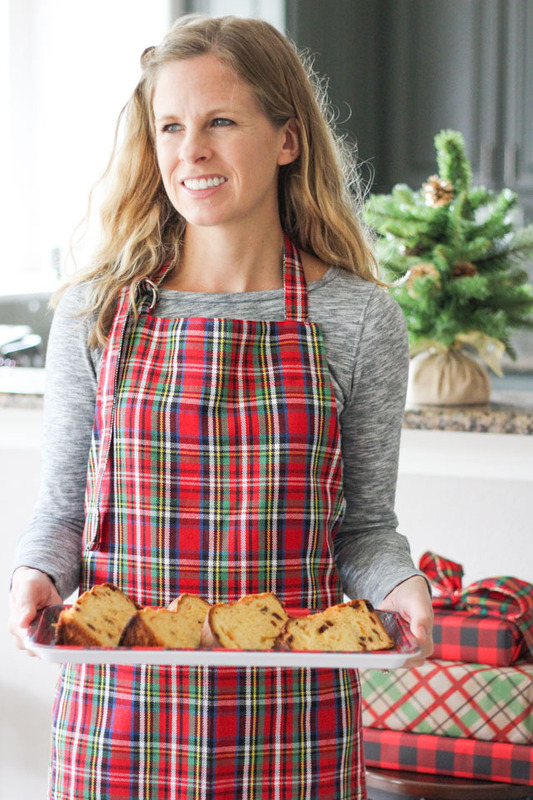 Needless to say, that’s exactly what I did when I saw all their fun plaid items, including this apron! 1. Don’t be afraid to mix all the plaids! When I was at the store I found a variety of different plaid prints. Rather than just go with one, like the buffalo check, I decided to mix several different prints together. Laying them out at the store helped me achieve the right mix. I found cute cloth napkins, placemats, a table runner, and a melamine serving tray and bowls. I always like to start with a unique centerpiece when creating a holiday table. One of my favorite tricks for creating a simple centerpiece that makes a big impact is to use a tiered serving platter. For our Christmas morning table, I filled the platter with a few different sweet treats all from Tuesday Morning. Yep, they have food too! 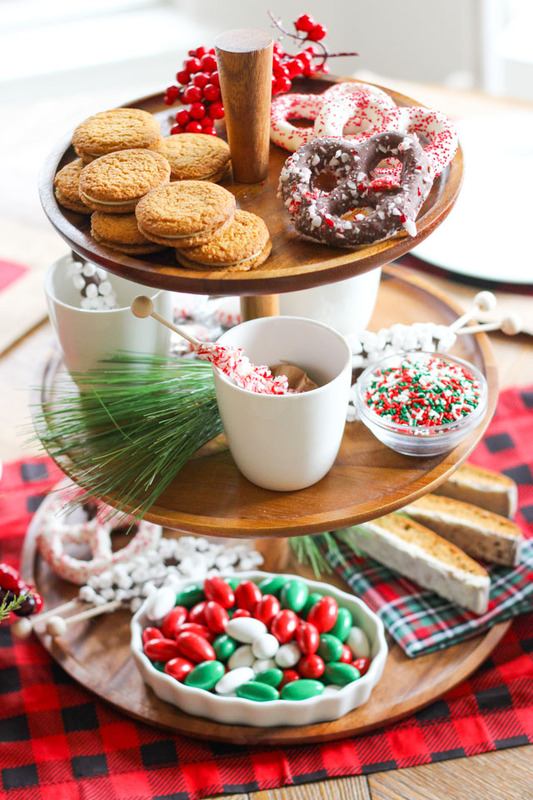 During the holiday season they offer all sorts of gourmet goodies at affordable prices like these candy-covered pretzels, hot cocoa peppermint stirrers, and jordan almonds. It took just a few minutes to spread out the goodies on the platter, I added some sprigs of faux greenery and berries for a final touch. 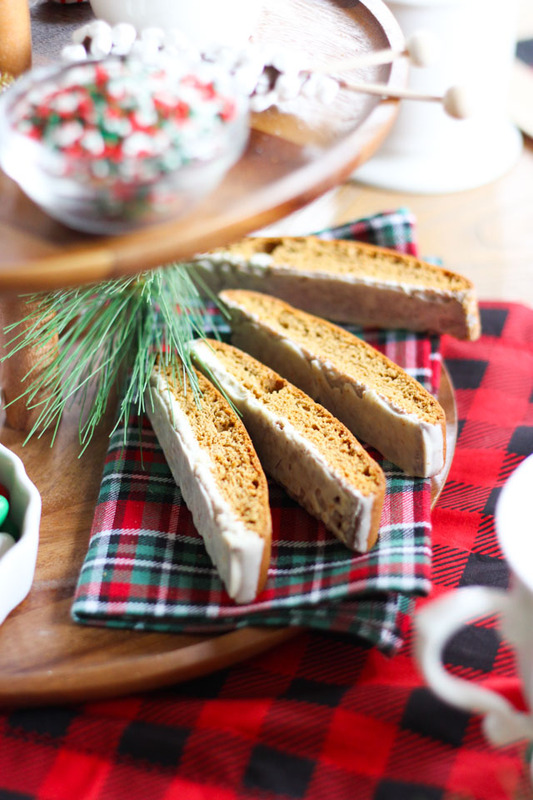 This gingerbread biscotti was my favorite! 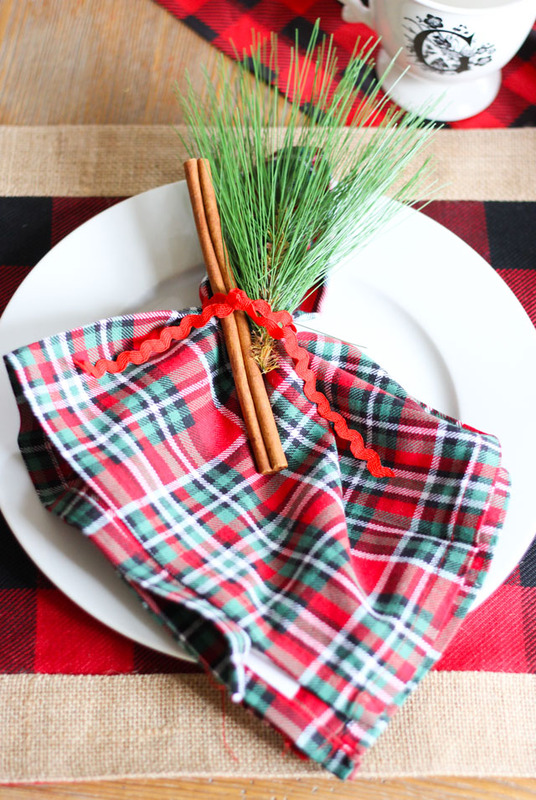 I spread them out on top of a plaid napkin for a little dose of plaid in the centerpiece. 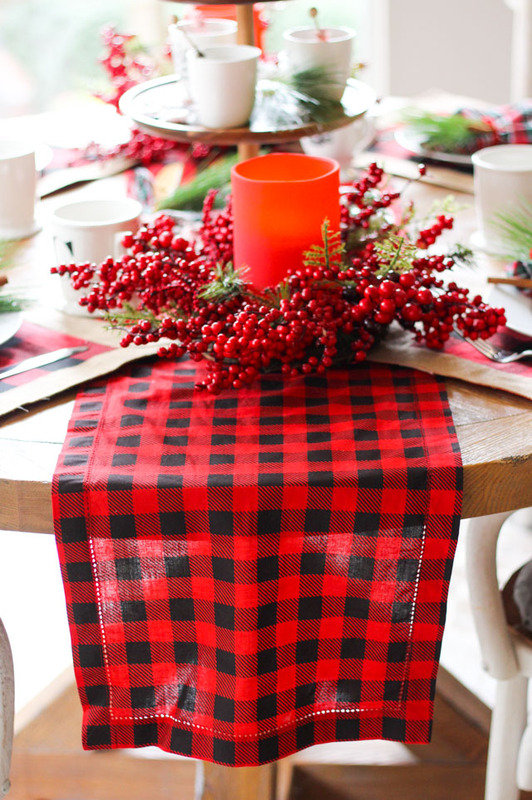 Greenery and rustic wood elements mix perfectly with plaid. 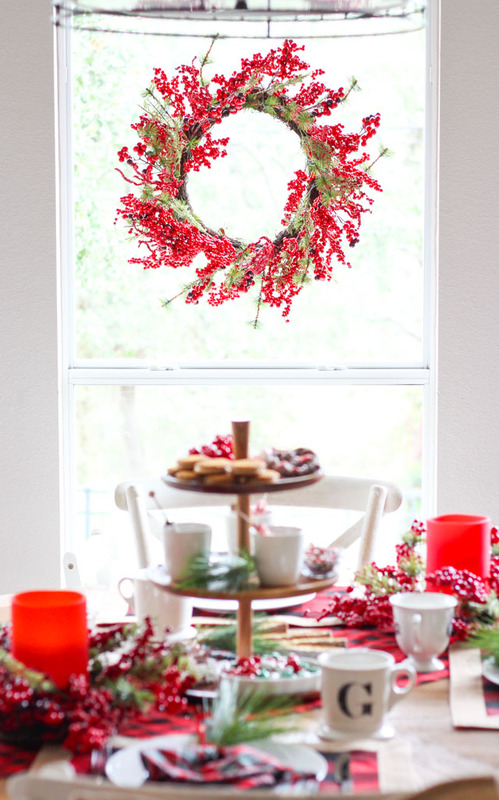 For our breakfast table, I skipped our fancy napkin rings and just tied an evergreen sprig and a cinnamon stick with a piece of rickrack. Beautiful, inexpensive, and FAST! I don’t know about you, but I almost never use a tablecloth. Runners and placemats are less formal and require less washing and ironing! This fabric buffalo check runner was only $9.99. I added two small berry wreaths on each side of the runner and put a battery operated candle in the middle. Make an even bigger impact by incorporating other decor surprises around your kitchen. 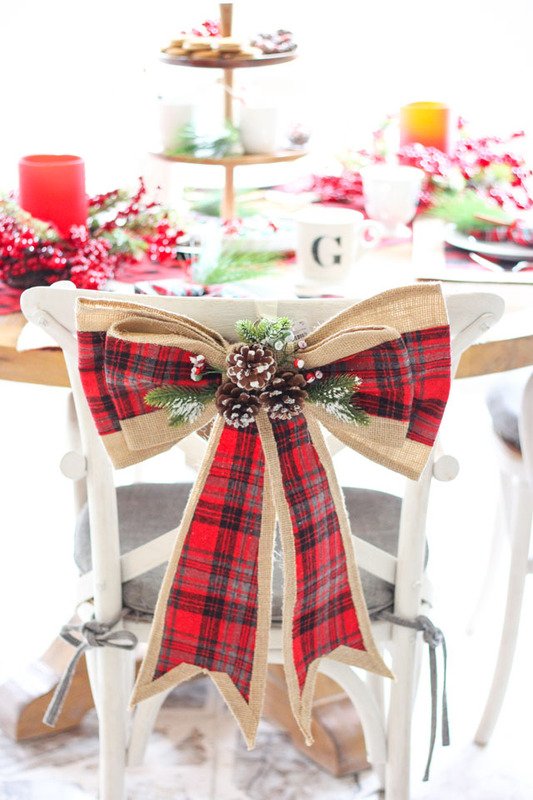 I added this pretty plaid and burlap bow to a back of a chair and hung a bright berry wreath on the window behind the table with a suction cup. On the kitchen counter I displayed a couple sweet little battery operated light up houses and a mini tree from Tuesday Morning. They even had plaid gift wrap and ribbon! Are these houses not the cutest? Tuesday Morning had a variety of styles for only $12.99 each! 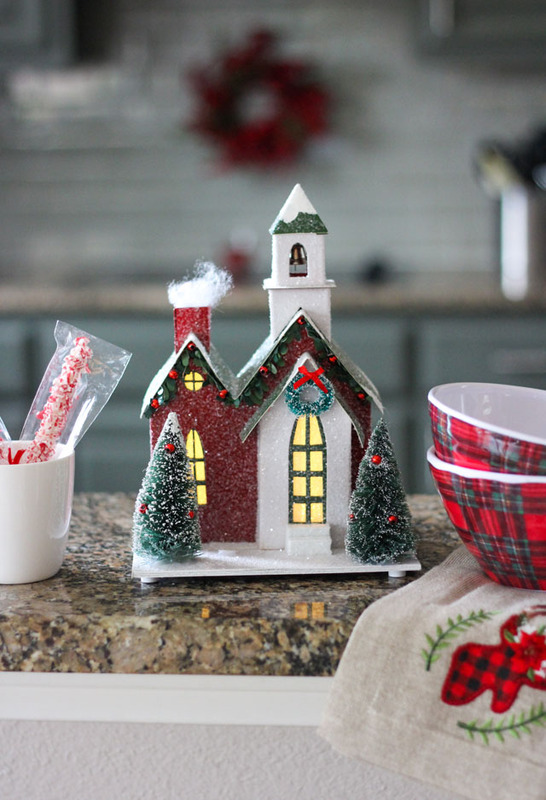 While I hope I’ve inspired you to incorporate some pretty plaid napkins or a treat tower into your Christmas table, you don’t need to go overboard. Just the simplest touches can make it special! Even though I photographed this table well before Thanksgiving, I wanted to actually enjoy it as a family before taking it down. My mom was in town visiting and we spent a Saturday morning having our fancy breakfast in our pjs. I made hot cocoa, eggs, and bacon to add to our treats. It was a special time together, and I can’t wait to do it all over again on Christmas morning! 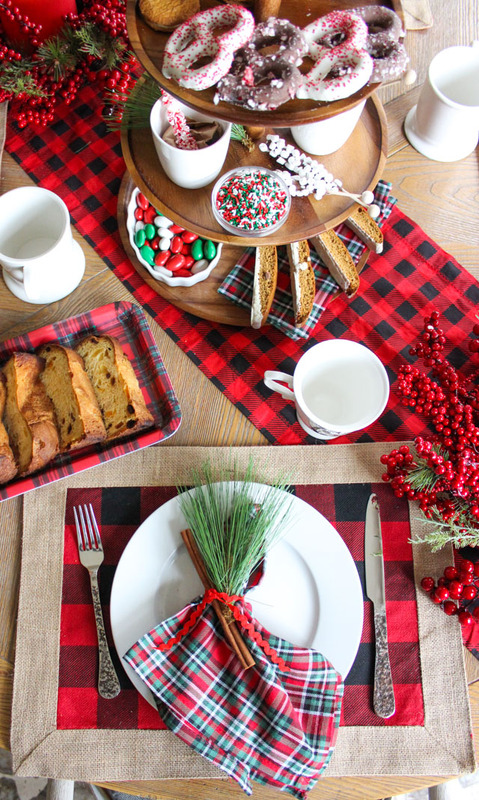 I think I may have to make our plaid Christmas breakfast table a yearly tradition. Thanks Tuesday Morning for helping us create a special holiday memory! This post is sponsored by Tuesday Morning.